Miguel Angel Alvarez-Flores and Diego Alexander Hernandez-Rivera are accused of killing a woman as a sacrifice to Satan. HOUSTON -- Houston police are looking into whether a missing Jersey Village teen was murdered by Satan-worshipping gang members. Jersey Village Police Chief Eric Foerster confirms that department met with HPD homicide detectives Thursday about a missing persons case from January. Gemesis Cornejo, 15, was reported missing by her family. Jersey Village police officers searched apartment complexes in west Houston looking for her but believed she was "actively hiding from them," according to Foerster. Two weeks ago, the body of a teenage girl was found on the side of the road on Sharpcrest near Corporate. Police said she had been shot twice at close range and has yet to be identified. The Harris County Institute of Forensic Sciences released a photograph of three rings she was wearing and a clothing description that included white high-top Converse tennis shoes. Cornejo was also wearing white high-top Converse tennis shoes when she went missing. Though the victim has not been identified, Miguel Alvarez-Flores, 22, and Diego Hernandez-Rivera, 18, are charged with her murder. During their first court appearance, they smiled and waved at the cameras. Later Thursday morning, at a second court appearance, they were more composed. 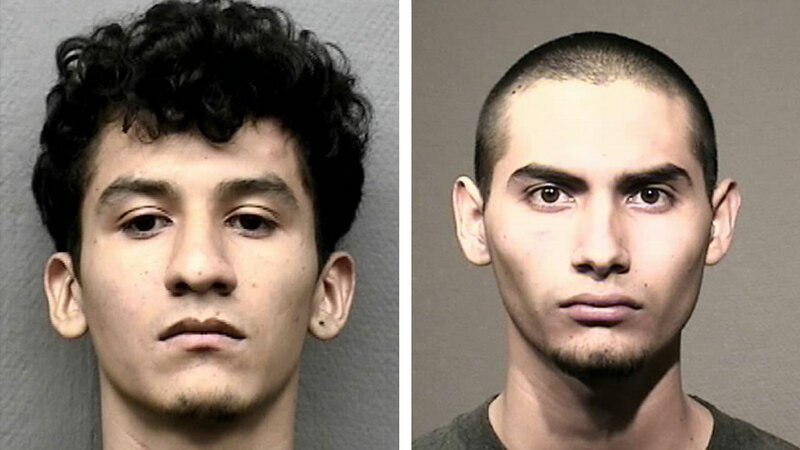 RELATED: Gang linked to satanic murder is "extremely violent"
According to court records, a 14-year-old girl says she was kidnapped by the two, held against her will in an apartment in S. Gessner near Westheimer and sexually assaulted. She told police Alvarez-Flores, nicknamed "Diabolical," was the leader. Her captors were MS-13 gang members and they worshiped Satan. The teen also told investigators they called Satan the "Beast" and another girl named "Genesis" was also at the apartment. When "Genesis" criticized a shrine dedicated to their satanic beliefs, she said, "Genesis" disappeared. The 14-year-old was able to lead police to Alvarez-Flores and Hernandez-Rivera. A prosecutor says Hernandez-Rivera admitted to shooting "Genesis." Both are charged with her murder and police are looking into whether "Genesis' is Gemesis Cornejo. HPD's Gang Squad is expected to release new information in the case Friday. Eyewitness News has learned detectives are in touch with the missing teen's family.